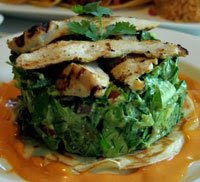 If you have never been to Taco Diner and enjoyed the Los Cabos salad . . . put the computer down immediately. It's like someone added a little fresh lettuce to the best guacamole you have ever tasted. And who can resist fresh bacon bits? My first attempt to recreate this at home was a ridiculously easy success. I left out the chicken and used thick slab cut bacon as the main protein. Los Cabos Salad Ingredients: 1 avocado 1/2 head of iceberg lettuce 1 shallot 1/2 lime bacon kosher salt (serves 2) Cook bacon over low/medium heat. While bacon is cooking: Chop lettuce into 1/2 inch pieces and place in medium bowl. Slice avocado directly on top of lettuce. Finely chop shallot and add to lettuce/avocado. Start 'mushing'. Add salt and lime juice and give one final stir. Serve with bacon crumbles on top. I would recommend enjoying with a glass of White Bordeaux. Not because it goes together particularly well. I am just hooked on White Bordeaux.